Since combined transport can only work on a nationwide base, all participants must see their advantage and reverse all existing systems must be open to all participants. Only through “open source” rail technology, which is based solely on the established standards (ISO container DIN 688 / roll container EN 20722 / WAB – load units EN 284) as a benchmark, KLV traffic can be used in an economical system across the board. Similar to the trend in truck special vehicles, as we note at our partner Scheuwimmer Fahrzeugbau GmbH from Naarn, we also see the trend in the railway industry for the separation of body and chassis. However, the current developments in the railway industry are considered critically, as ultimately “only” existing special wagons are replaced by modular wagons, which are not roadworthy without an adjusted setup on the one hand , on the other hand, the setup itself with the cubic volume is not suitable for road traffic. The market potential that can be generated for railway operations – adjusted by the changed economic efficiency calculation – remains the same in the end. 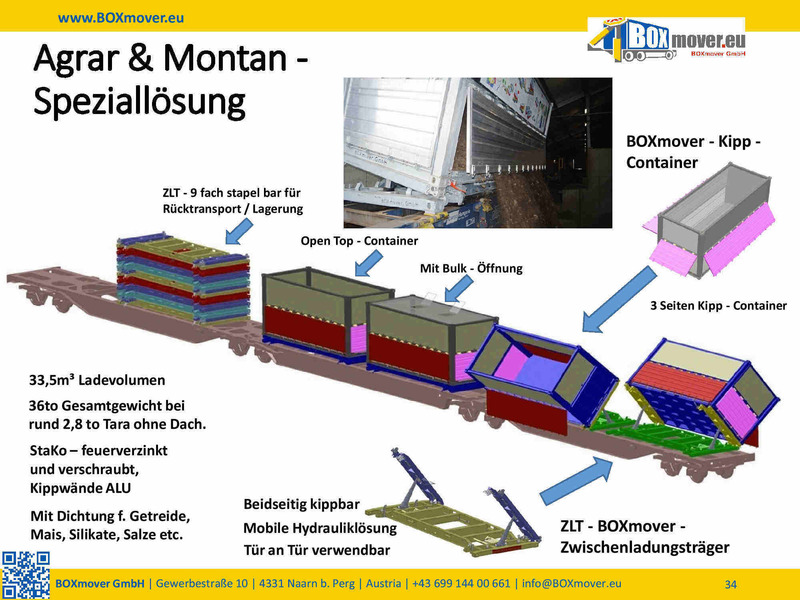 BOXmover GmbH has been developing efficient solutions for several years, which are suitable for both rail and truck, in order to offer ideal conditions in both “worlds”. The BOXmover – technology is seen as “open source” technology to connect these worlds. A.) Companies with railway connection at the production and at the customer already use rail transport. Companies that only have a rail connection at the consignor or only at the consignee are the logical extension. For this purpose, loading units are required, which are both road and railway suitable to serve the pre- and caster. B.) The railway must offer itself as an alternative to the road, not as a “last option”. Companies construe their equipment for optimal road transport. The duty of the railway is to generate a competitive advantage with the same equipment. This happens through effective handling and by bundling the transport streams. For this purpose, charge of different customers must be transported on a train. This only happens if you offer an “open source” technology to ALL charging units. C.) The classic bulk goods of the railway are raw materials / building materials or goods which are not subdivided into smaller standardized packaging units. The agricultural and mining products play an essential role. The task here is the effective handling of the loading unit. Railway operation is characterized by a sytem in which one loading unit is positioned behind the other. An effective handling can only be conducted by a quasi-self-discharge. 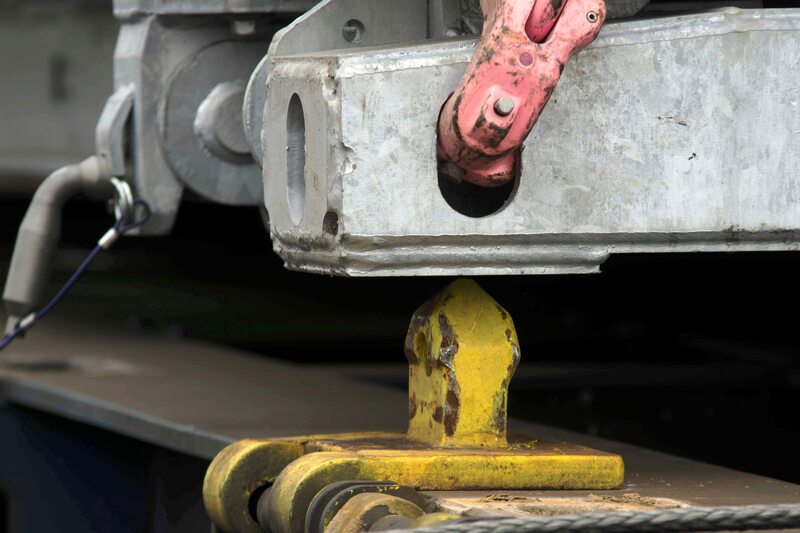 In order to be compatible with other loading units – outside the classical railway operation – the loading unit must be suitable and optimized for both rail and truck. D.) In order to be able to minimize empty runs on the railway, similar goods – in the case of special wagons – have to be transported in one direction and in the other one as well. (In practice, however, this is not realistic.) Rather, it must be attempted, similar to the truck transport, to design the loading units in such a way that the load A can be transported on the one transport route and the load B can be transported equally optimally on the return route. The key to success lies in the reduction to standardized loading units and appropriate technical know-how to find intelligent solutions. E.) Liquids in 7.82m SWAP – BODY containers are widely used in the chemical and food industries. Currently, these units can only be handled by gantry crane or reach connector. A small adapter on a standard BOXmover side loader can manipulate these load units as well. dges of gantry cranes or reach plug. G.) The weight distribution is also – at 20ft / 7.45m / 7.82m load units ideal for rail operations or truck traffic. On the road there is a maximum payload of 32 tons on the loading unit, with a SGNS 60″ wagon it is 70 tons for route class A and 60 tons for route class B for two loading units. 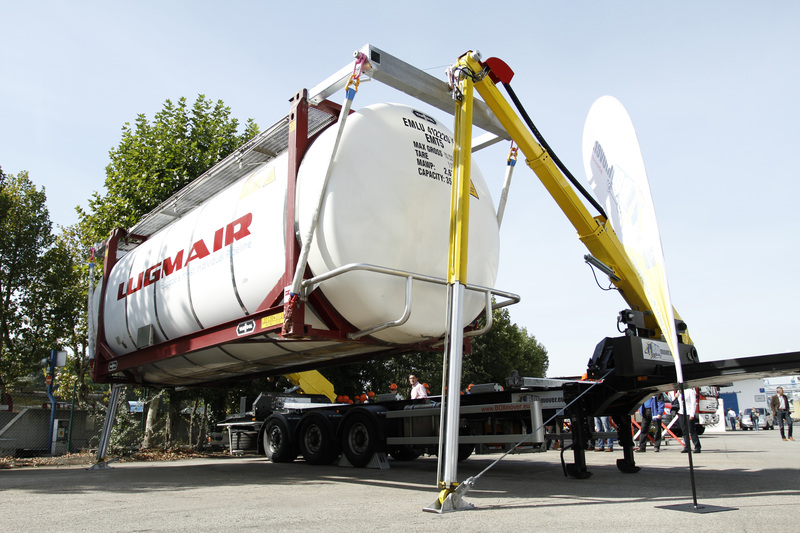 The 20ft / 7.45m / 7.82m load units are designed in a way they can be transported empty or filled with light materials, even with two loading units on the truck, which reduces the handling of the empty loading units by half. H.) In addition to the BOXmover side loader, we have developed, produced and already tested a BOXmover tipping container and a BOXmover tipping unit on a train wagon, especially for all bulk goods but also all other mentioned products. Of course, we also offer the appropriately adapted road equipment, such as container chassis, swap bodies and roll-off containers. 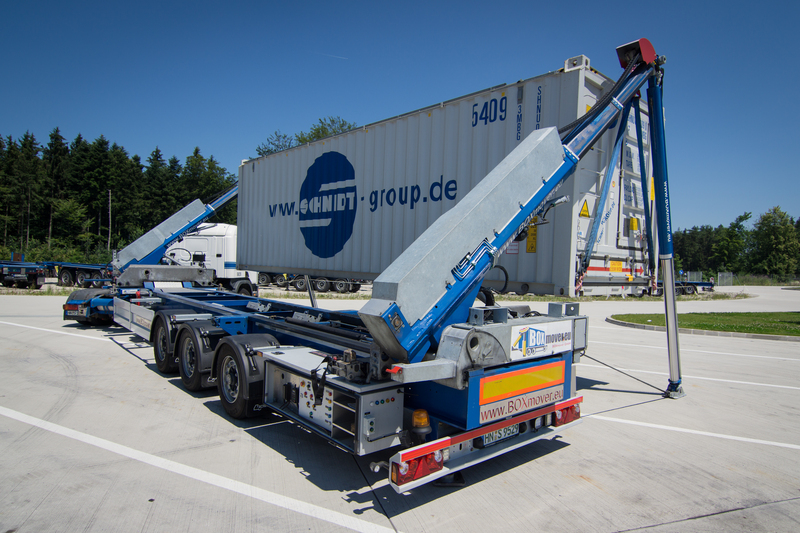 On the part of our customers of the company Scheuwimmer Fahrzeugbau GmbH, the possibility of roll-off containers with additional functions is increasingly in demand. As standard, we already offer an ISO compatibility. All developments together would be an ideal overall concept to sustainably get more substrate on the train without being in direct competition with existing rail transports. Essentially three types are discussed: the ISO container, the swap bodies and the roll – off container. The necessary key is to bring these three types together so that all three types can be manipulated on the same wagon and with the same handling equipment. 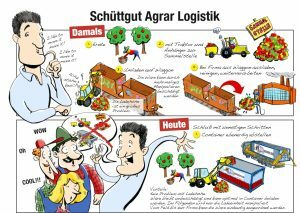 BOXmover GmbH offers the right solution for this. ♦ Existing structures are increasingly being used. Terminals can serve as empty container depots and main transhipment accounts, the sidings as decentralized transshipment nodes. It must be irrelevant for the loading unit whether the handling takes place with a container crane, with a reach stacker or a side loader. Depending on the traffic, you will choose the right equipment. For pre- and post-carriage, as well as for the provision of loading units should be placed increasingly on regional logistics providers and on the “reason” of the shipper. In the medium term, the loading company should also be the owner of the loading unit. Then the company can freely choose the mode of transport (lorry / BAHN or others). As a result, the quality and strengths of the established railway providers will increase – not least because of the environmental considerations. 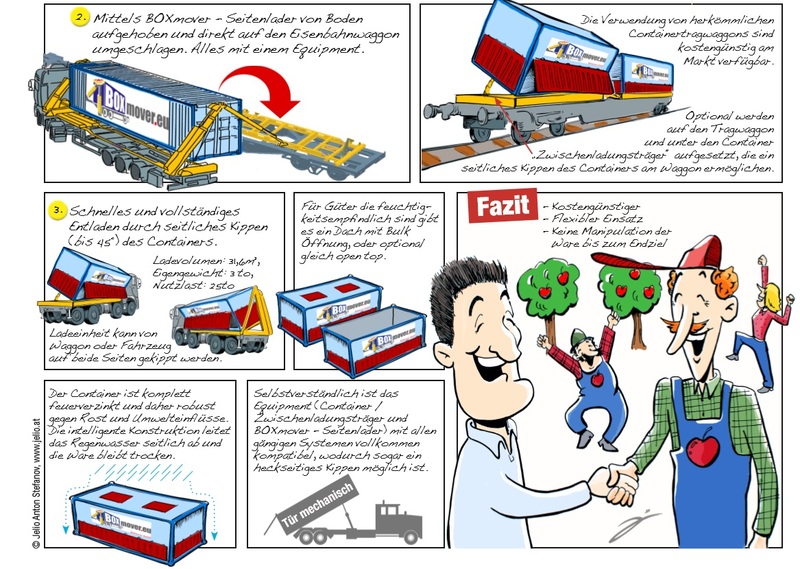 ♦ All other solutions that require a specific type of loading unit and / or an adaptation of the wagon are counterproductive for widespread implementation, since one can not assume that a dominant position in the entire transport industry (rail and truck) would be sustainable. ♦ On the rail side, only standardized container wagons (SGNS 60 “) or similar are used. In principle, all container wagons are suitable without any modification. Even with different handling equipment, a continuous transport chain must be guaranteed, even with third-party equipment. ♦ The BOXmover tipping container complies with the ISO standard and is designed for bulk goods up to a maximum gross weight of 36 tonnes. Due to its corner construction, the container differs decisively from all other containers on the market and thus enables a modular construction for flexible design. It does not matter whether the container is equipped with front wing doors, an unwinding device or a flap door. The container is screwed together from modules and thus guarantees a cost-effective production and a simple repair in case of damage. The side walls are foldable and can be used for rail loading (not only on a ramp or on the ground). The container has the same load securing measures as are known from the truck sector, as the gaps between the spaces can be designed more freely thanks to the innovative corner construction of the BOXmover tipping container. All longer loading units (over 20ft ISO dimension) up to 7,82m total length have an ATCS – unrolling system at the BOXmover tipping container. ♦ ATCS systems are used especially in the agricultural, mining, but also in the waste disposal industry and in the regional distribution of goods. For package freight and pallets – goods, swap bodies are used. With minor adaptations (especially the conversion to ISO corner fittings), an ATCS unit, which is very widely used in agriculture, becomes a railway equipment suitable for railways. With the developments of the BOXmover GmbH, but also through the experiences in the special vehicle construction with the company Scheuwimmer Fahrzeugbau GmbH BOXmover GmbH offers the possibility of an “open source” combined cargo traffic. The established railway companies profit from their nationwide presence in the home market and from the possibility to cooperate with other logistics providers, RUs or carriers domestically and abroad. Imagine a single wagon or wagon group traffic, where it is independent where and how the SGNS 60″ container wagon was loaded and by which railway operator, because anyone can unload it anywhere, either with gantry crane, reachstacker or side loader. 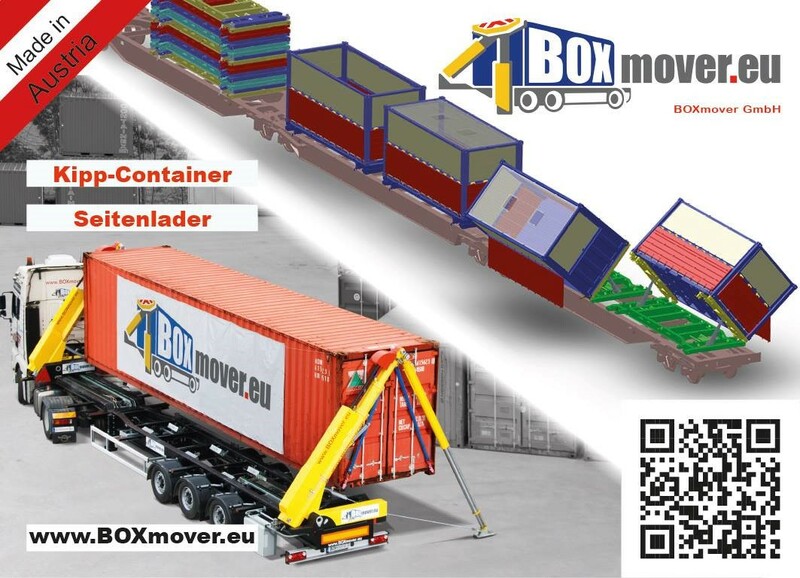 Be innovative too and become an independent BOXmover with the technologies of BOXmover GmbH!